This is a long over due post (almost 10 days?) but I think it’s worthwhile. I headed up to Fish Camp late Friday morning to get packet pick-up and everything done before sunset. 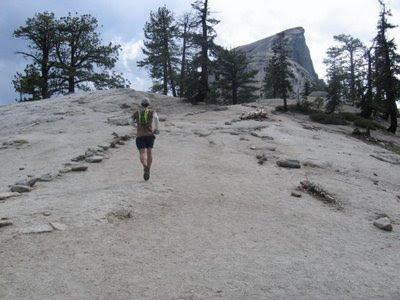 The plan was to run Shadow of the Giants 50k (actually 34 miles) on Saturday and then hike/run up to half dome (aprox 18 miles round trip) on Sunday. Sleep had been limited coming into the weekend, and the 2:53 marathon on Monday (4 days earlier) had left me sore and limited me to some gingerly jogging for a mile or two on Tuesday and Thursday. I spent the week covering my last lessons in my online classes and working in the shop as much as I still could. I didn’t test myself at all during the week, and it wasn’t until the race that I found out how little power and endurance I had left in my legs. My game plan though was to just enjoy the race, but try not to get chicked too much. The course was at 5000-6500ft altitude, so that was a bit of a problem for the first 2-3 miles, but my system eventually acclimated and it wasn’t much of a problem. I ran along solo for a little bit, but soon ended up in the presence of a great legacy runner of both the SOTG 50k and the San Diego Rock and Roll Marathon, Rob McNair. Yes, those races are historically on the same weekend, (SOTG on Sat, RNR on Sun), and yes they are over 300 miles apart. He even dresses up as elvis at RNR.. 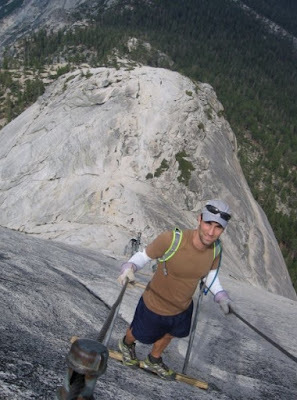 In ’07 at SOTG 50k, he took second overall by a mere 2 seconds..
We climbed steadily for a bit, and though it was mostly runnable, it wasn’t breathable for me yet, and I had to a walk a couple parts. We had a nice long downhill after mile 3 and I talked to a rookie 50ker who was a retired 37 year old from Fresno, Mark Dorman. We came across the stream crossing together and into the first major aid station. He had trained well for the event and though he was cautious about his pace early on, he ran well and eventually finished in 35 minutes ahead of me. Coming out of the first major aid station, the course traversed along a hill for 1.5 miles before heading some some switchbacks and then giving runners a nice hour or so of downhill run running into the shadow of the giants 1 mile loop. I lost Mark on the switchbacks heading up, but caught him later in the 1 mile loop. The problem with the long downhill section was that I wasn’t patient enough to eat at all during it, and hadn’t eaten much before it at the aid station. When I came into the 1 mile loop with the 2nd major aid station, I was famished, and ate some graham crackers and coke on the loop and thereafter leaving the aid station. I had a decent amount of cola gel blasts, margarita shot blocs, and salt sticks, but as we started to head up a gradual uphill, I had no power in my legs. The course became frustrating as I got chicked twice and there was nothing I could do to respond but try and keep walking fast and eating more. As I came into the last major aid station, I decided run a minute and walk 30 seconds for as long as I could.. it lasted for about 20 minutes, but it wore me out. I came through the creek crossing and began to hit some un-runnable hills for a bit. The eventually flattened out, but I still had trouble pushing any thing other than the smallest hill, and I walked for a good 30 minutes straight. As mad as I could’ve been, I still was happy to be out in a beautiful setting, enjoying the mild temps and the clear skies. I came into the last 5 mile downhill stretch, and opened up my stride again finishing in 5:39, a minute behind a guy that I had no idea I was closing in on until I checked the results today. I iced in the stream near the finish line and got out just as the thunder began to roar through the valley bringing showers in soaking the post 6 hour runners. The mist trail heading up to Vernal falls in the late spring is more like the monsoon trail. We were in the thick of the mist for less than 5 minutes, and were soaked thoroughly. The trail was a well manicured, carefully carved connection of natural rock steps, and manually installed railings. 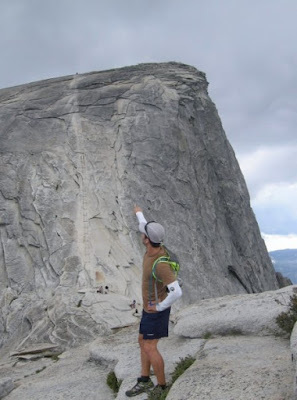 All the way up to Half-Dome, we saw the hard work and effort that had been put into the park. 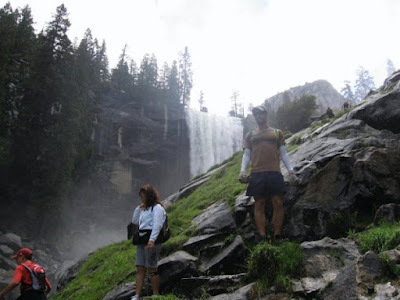 After passing the main viewpoints for Nevada Falls, we started running for a bit in the flat before hitting the main trail head for half-dome that zig-zagged in a gradual uphill slope for another 3-4 miles. 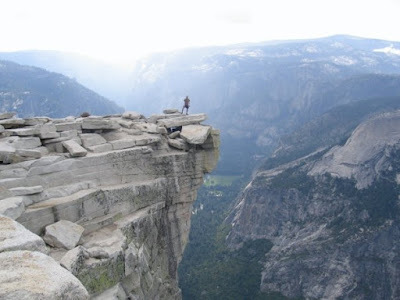 Upon reaching the base of the exposed face that lead to half-dome, thunder began roaring through the valley. Though no rain fell on us, we heeded the warnings of a father and son about the dangers of hiking on an exposed rock face in a thunder storm. After an hour, the clouds began to part, and we hoofed it out to get to the base. Plenty of gloves were left, and we began to climb up the cables. The climb was a bit challenging after the race the day before, and we stopped a couple times to catch our breath and rest our arms. On the way down I did a little “freestyle running”. 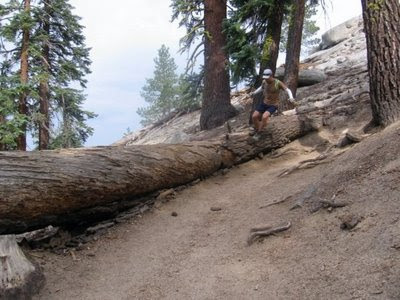 I like to think of it as cross-training for trail running, but really it’s just me goofing around trying to get hurt. We flew down the opposite way of the mist trail and enjoyed the “you guys are crazy” remarks of hikers as well as the incredible views..
Yosemite Valley is a surreal place. As the sunset over the valley, people (us included) pulled off to the side of the road and watched the sunset over the valley as if it were a 4th of July fireworks display. The park rangers who work there probably have the best job in the world, but also likely find everything else in the world pales in comparison after being in Yosemite. Overall.. it was a pretty good weekend.